We are within 48 hours of Wrestlemania 31. As if that isn’t a great enough reason to feel good if you are a wrestling fan, we also have the knowledge that the biggest star in sports entertainment, the main drawing point for this year’s ‘Mania, is staying put. Earlier this week, WWE World Heavyweight Champion “The Beast” Brock Lesnar announced (interestingly enough on ESPN and not through any wrestling-based media, including that of the WWE) that he has reached an agreement with the world’s largest wrestling promotion to continue working with them past this Sunday, when his latest contract with the WWE was to come to an end. Lesnar’s revelation put to rest months of speculation that he may leave his cushy, part-time schedule as the reigning monster of the WWE in order to try and prove himself once again in the Ultimate Fighting Championship, where he once reigned as its Heavyweight Champion in a previous spell away from grappling. In one swift — yet long worked-for — move Vincent Kennedy McMahon’s entertainment powerhouse secured its immediate future, starting with the main event for Sunday’s WrestleMania where Lesnar will defend his title against the assumed future of sports entertainment, Roman Reigns. This is no less than the biggest signing by McMahon since bringing back Dwayne “The Rock” Johnson for action in 2011. Granted, The Rock has remained on a SUPER part-time schedule in the four years since but he’s managed to garner significant air time in each ‘Mania after ’11 (headlining two in matches with John Cena). Bringing Rock back to the WWE was not just a big deal for the business, the whole entertainment world took notice. Starting with its crossover news moment for the announcement, resigning Lesnar will have a similar impact but with some deeper effects. Professional sports entertainment is a cut-throat business and the WWE has done some cutting at the behest of its steward, McMahon. Decisions are made with little sense of remorse or personal regret, the machine keeps going regardless, but some decisions can be made to hurt or stop other machines. Last year, former WWE Superstar CM Punk signed on to his former company’s competitor (whether they’d admit it or not), UFC. Losing Punk — and much of his devoted fan base — to Dana White’s MMA promotion was major lost for the company. After Punk left the WWE, he unloaded some very harsh words for his former employer that I’m sure did not sit well in the worldwide headquarters in Stamford, Connecticut. Whether they meant it or not, being able to keep Lesnar away from the UFC was definitely a shot back at White and Punk. After the events of the past year, the moves of CM Punk and Lesnar seem like a trade between WWE and UFC. Brock had already left the WWE once and proved himself to be a big draw as an MMA fighter, winding up in the promotion’s title mix almost instantly. Surely McMahon & Co. was not willing to let that happen again, not when they could promote him and reap the many rewards. 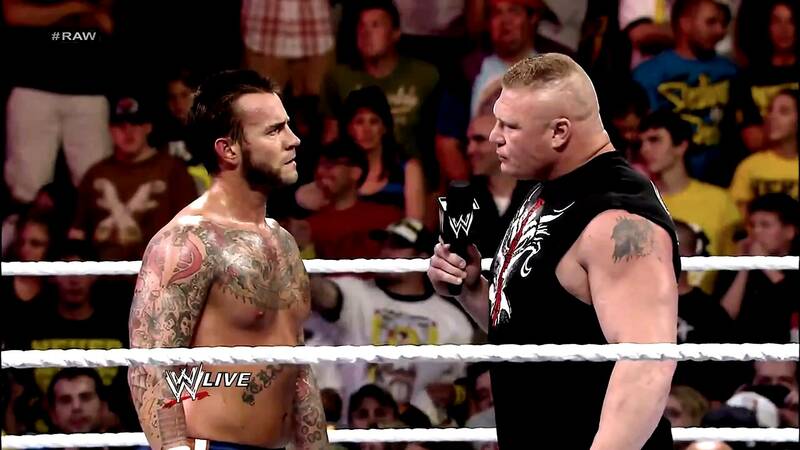 Its too bad fans won’t get a SummerSlam rematch of Punk vs. Lesnar, either in the octagon or in the squared circle. Efforts by the ‘E were surely high to retain their most dominant star but one could figure that the most prominent reason we’ll see more of Lesnar wrestling than fighting past Sunday is also the most obvious one — The Beast will continue to feast in the WWE. Starting with Sunday’s big match in which he will defend against a surefire prospect of the cross-over sports entertainment star variety (it has to be stated here that at the top of Roman Reigns’ qualifications is that he is a little cousin of The Rock) Lesnar has an ever-deepening list of established and up-and-coming Superstars who will give at nothing to get a shot at him. With the contract situation still in the air, most fans thought Brock was for sure heading back to the UFC and resented the possibility that Reigns (who most fans see as too green for even this title chance) would be crowned the new heavyweight champion with an uncontested landscape in front of him, but now that prediction has been put in question. Nothing would be unquestioned as long as Lesnar is in the mix. Should Lesnar retain his championship we can easily imagine him squaring off against any of these fan favorites in upcoming main events: Daniel Bryan, Dolph Ziggler, Seth Rollins, “The Big Guy” Ryback, Bray Wyatt. We can even get re-matches against the likes of John Cena or The Undertaker in order to keep The Beast sharp for next year’s Super Bowl of Wrestling. As Wrestlemania 32 does become the next mile marker in the business, the one match most WWE fans would love to see is Brock vs. Rock. Maybe that could be the headliner of the 2016 ‘Mania, which will try to draw 100,000 spectators at AT&T Stadium in Dallas, Texas. Beyond the large spectacles to come with Lesnar, another great perk of him staying around is more opportunities to see the man, always worthy of an event you pay for, on Monday Night Raw, SmackDown and the WWE Network with his tireless advocate Paul Heyman making more and more genius promos getting over THE BEAST, BRRRRROOOOOCCKKKK LESSSSSNNARRRRRR!!!! All these possibilities couldn’t make me more happy as a fan and as a whole the WWE “Universe” is back on its axis. We all get to see one of the most dominant WWE Superstars and athletes of out time perform and not worry about him being in a situation that he can’t handle. Beasts still do exist and that makes the future of the WWE much less scary. As much as any wrestler stands to win big on Sunday, the biggest winner of this Wrestlemania week may be ESPN’s Michelle Beadle, who has taken it upon herself to break all kinds of big wrestling news. Beadle already was the interview beneficiary of Brock Lesnar’s announcement when she sat down with his advocate, Paul Heyman and his upcoming opponent Roman Reigns for this first edition of her “BeadleMania” podcast done in conjunction with Grantland, who for a while has maintained itself as a mainstream source who holds no shame in providing a platform for wrestling commentary. The interview above, a breeze coming in just over 21 minutes, works well with a delicate balance of “shooting” and “working.” In all, the interview does exactly what it was meant to do — it makes you want to see the main event of WrestleMania that much more, it even allows for a reasonable suspension of belief regarding Heyman and Reigns’ relationship that could lead to an explosive story turn at ‘Mania. And if Heyman isn’t one of the best storytellers in popular culture right now, let his podcast-capping tale of “Ravishing” Rick Rude and the clueless Governor firmly establish him with that title. Follow Demonze on Twitter @demonze1 and listen to him and Ken Davis on Regal Radio’s The D and Davis Show, Saturdays at 11 am.